Telecom Cooling Design using 24V 4-Wire fans. The challenge of this telecom cooling application was to provide advanced features required by the customer into a small circuit board area. 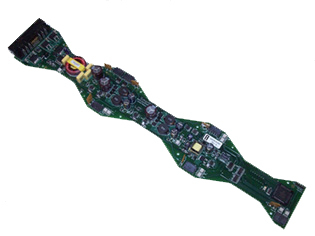 The unusual shape of the PCB was designed to “wrap” around six fans, allowing more area for fan speed control circuitry. This multi layer board has parts on both side and uses fine pitch SMT components. The success of this innovative fan speed control design resulted in it being used in three telecom cooling platforms by the customer. CRI’s ISO 9001:2008 registered electronic design and manufacturing facilities have the capability to provide complete custom fan speed control design for telecom cooling applications from prototype to production. Please contact us to discuss your custom telecom cooling application needs. fan speed control design & telecom cooling requirements.